I have hit a century! Yes, this is my 100th post. Like the batsman who is eager to get to this figure as soon as he begins his nineties, so was I while arriving at this magic number. But like the batsman, I too was reeling under the " 90s syndrome" and every post was taking its own sweet time. So, what's the deal now that I HAVE arrived here? Nothing folks, just a happy smile on my face and a wish that my passion carries a little further, my writing gets more inspired, my interest continues unabated and of course, that I win more readers. A hope to reach out to more and encourage my silent readers to share their thoughts with me. As I pondered over what my topic for the milestone post should be, I found myself wanting to go back to some my previous posts and capture the journey so far. I thought, why not share this journey with all of you? For those of you who have been with me from the beginning, I ask you to accompany me in my journey to revisit the past and for those of you who joined me much later, I invite you to join me and add more colour to my space. The choice to be: A post that is close to my heart and written in the initial days of starting this blog. Pay cut: A good maid is hard to come by. Are we then ready to go a extra mile to keep a good one? Wife-y and motherly blues: This was written was R was quite young. The scenario is still fresh in my mind and makes me smile (now). 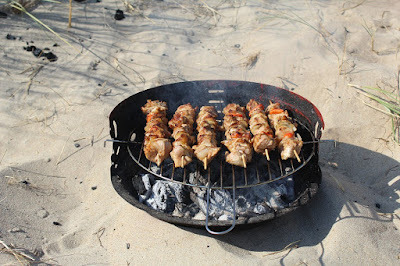 Cooking it up: A post of my cooking abilities or the lack of it. Then..and..now: If you believe in the law of karma, this is for you. As you like it: I'm sure most mothers of toddlers would relate to this. Before, I start linking my entire blog here, I better take your leave :-) Have a great week ahead..
Congrats on the century.. Wishing you many many more centuries. Hey.. congrats Uma!! May you make more centuries!! :) I guess i have missed out a lot of posts of yours.. would definitely read them soon.. :) Congrats again.. n keep writing! Do read them, Radhika. I am glad to have regular readers like you who don't fail to give encouraging comments. Thanks again! 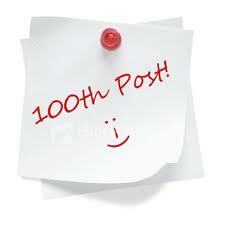 A 100 posts completed feeling is really special....wayyyy to go!!!! p.s: I'm so glad I'm able to comment now....looks like whtever the glitch was it sorted out itself coz till arnd 5 days back the page blanked out when I hit comment. feels great to see your comment again on my post..was missing you here..
am glad too that the hitch got sorted. Am off to reading the posts you've linked ....have a fantastic time and keep writing!! thank you so much ME!!! Congrats Uma!! I have enjoyed reading every one of your posts ever since I started following. Most of the links you posted are familiar to me, am waiting to check out if I've missed any by chance :). To more and more posts ! Here's to more many more years of blogging! so sweet of you to say that..
Hey, congrats on the milestone! Haven't got around to reading all the linked posts.. Will do it over the weekend! And keep writing! hey Kavitha, thanks a lot! Glad to know you follow my posts. Do you blog? I haven't started blogging yet, though I have been thinking about it for a while (a couple of years :)!!). Will let you know when I start one. Waoh! What perfect occasion to drop by at your place. CONGRATS ;) It really is a milestone. hey Purnima, thanks a lot!!! !